FREE MARKET TOTE beginning October 24th - October 31st with any Vera Bradley purchase of $35.00 or more! All our bras for our Tickled Pink Bras for a Cause of up on Facebook. You can bid on them by email to angela@ivyridge.com or by logging in to Facebook and placing a bid in the comments area under your favorite bra. Click below to see all our bras. You do not have to be a member of Facebook to see the photo gallery. 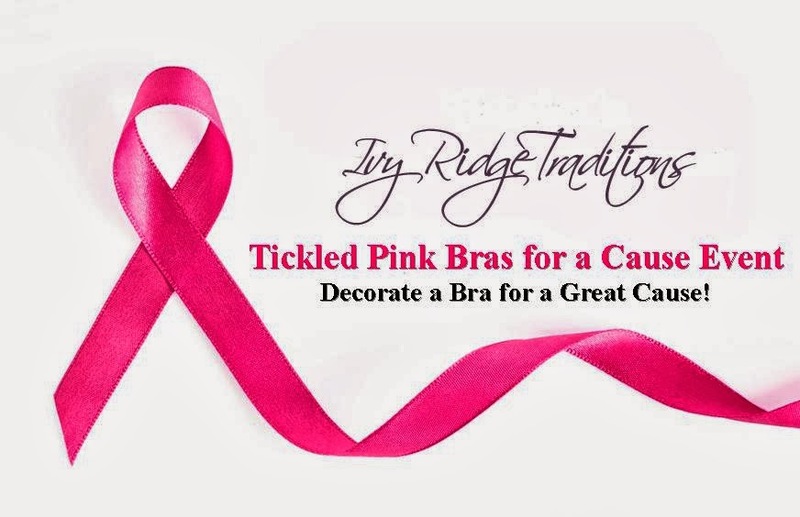 Stop by the North Wilkesboro Shop for a tour to see all 23 bras in person. They are all adorable! You can vote for your favorite bra and the artist with the most votes will win a $50 Ivy Ridge Gift Certificate. You can also register for a Ribbons Two-Way Tote and Strap Wallet ($113.00 retail value). We are asking for a $2.00 donation for each register card you complete with the funds going to the Vera Bradley Foundation for Breast Cancer. Vera Bradley's New Home Collection Including Great Recipes! Vera Bradley Home is Here at Both Shop Locations! 1. 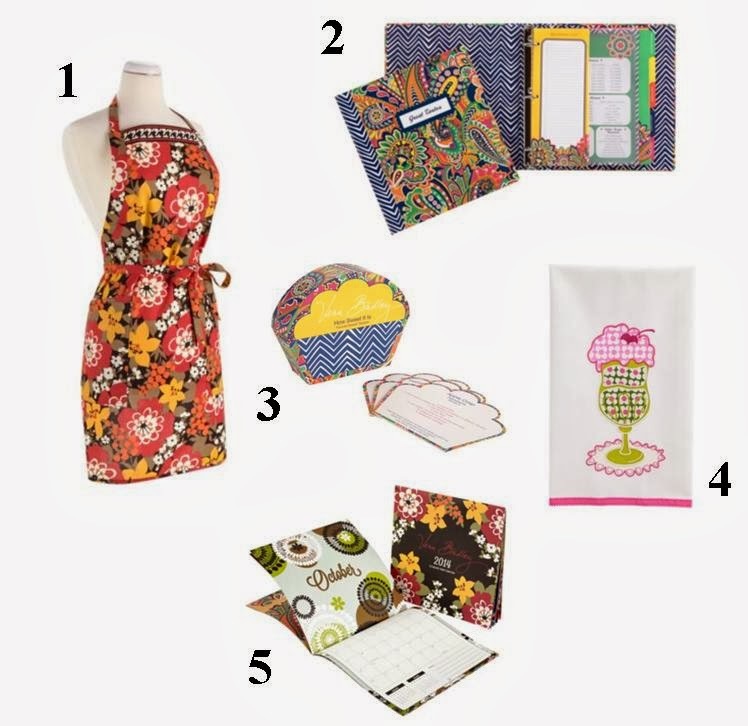 Apron: Cook up some fun with this colorful apron. Long waist ties and a drawstring neck allow it to adjust for a perfect fit. 2. Taste Great Recipe Organizer”: A place to organize all those favorite recipes! This three-ring binder is separated into five sections (Soups & Salads, Appetizers, Side Dishes, Main Dishes and Desserts) by colorful dividers with pockets. 3. 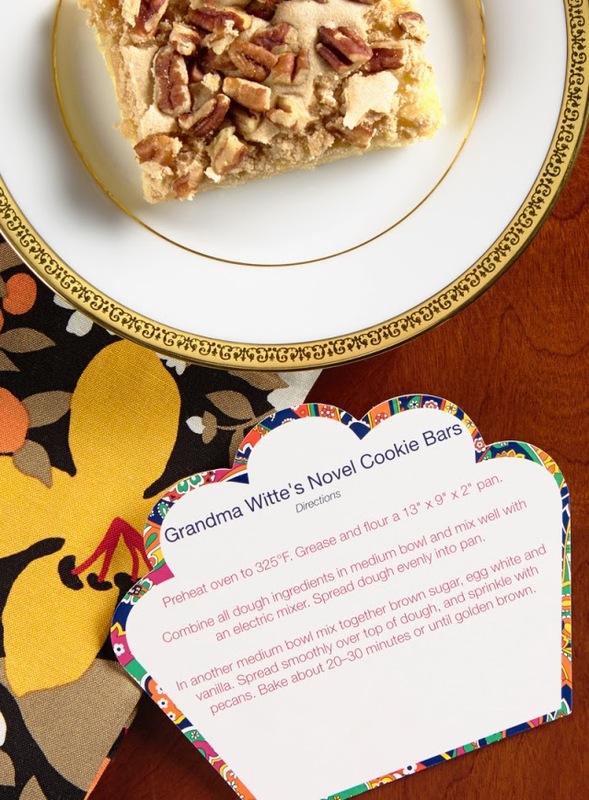 How Sweet It Is: From coconut macaroons to cinnamon pecan ice cream to spicy hot fudge, these favorite dessert recipes came straight from our own designers! Twenty cupcake-shaped recipe cards are housed in a matching box. 4. Tea Towels: As practical as they are pretty, these darling kitchen towels feature lots of lovely details, like embroidery, screen-printing and twill-tape accents. Available in Heather, Olivia Pink (shown), Bittersweet, Lola and Venetian Paisley. 5. 2014 12 Month Wall Calendar: A daily reminder to “be colorful,” this 12-month wall calendar features fun interpretations of a dozen Vera Bradley Signature colors. Large date squares and a notes area on each month provide plenty of room for writing in events, appointments and more. How About a Great Recipe from the How Sweet It Is Recipe Box? 1. Preheat oven to 325 degrees. Grease and flour a 13” x 9” x 2” pan. 2. Combine all dough ingredients in medium bowl and mix well with an electric mixer. Spread dough evenly into pan. 3. In another medium bowl, mix together the brown sugar, egg white and vanilla. Spread smoothly over top of dough, and sprinkle with pecans. Bake about 20-30 minutes or until golden brown. We Need Your Decorated Bras! Tickled Pink Bras for a Cause Event ! Bras are due to one of our shops by October 17th. between October 18th through October 31st at Noon. All entries will receive a special "Thank You"
Vera Bradley gift for your support of this special event!